Great 1950s Lee Riders. Half Selvedge denim construction with a Scovill Gripper Zipper zip. 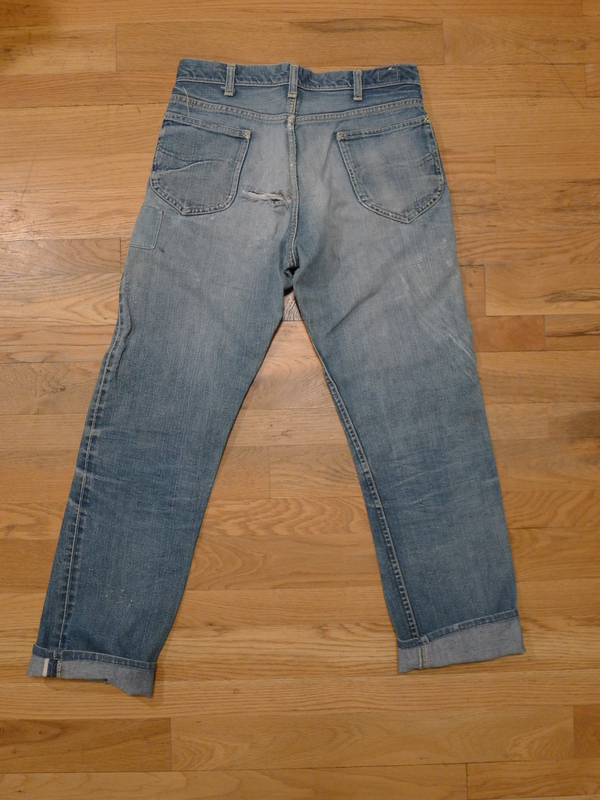 This particular pair of jeans measured about 28×28, but had been taken in at the waist and down the outer seams of both legs to construct a slimmer fit. The indigo was still dark, a desirable trait for jeans of this age. See my other Lee Riders post for an example of a slightly later pair. Lee Riders, also known as the 101Z debuted in the 1950s and represent a transition from the company’s work wear history in to more casual, mass appeal wears. 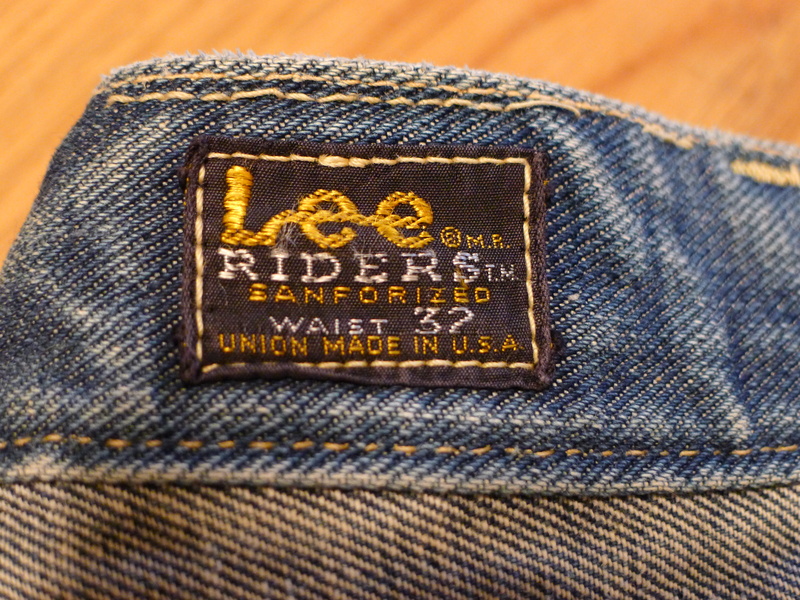 On this particular pair the inside Tag is marked: Lee Riders Sanforized Waist 32 Union Made in the USA. 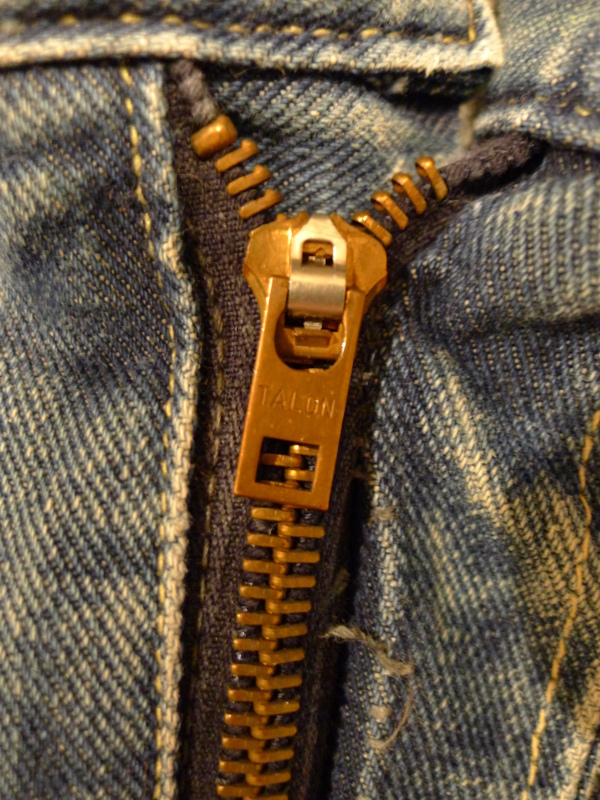 The Button back is stamped: R. Zipper is made by Talon. Lee riveted front and coin pockets. 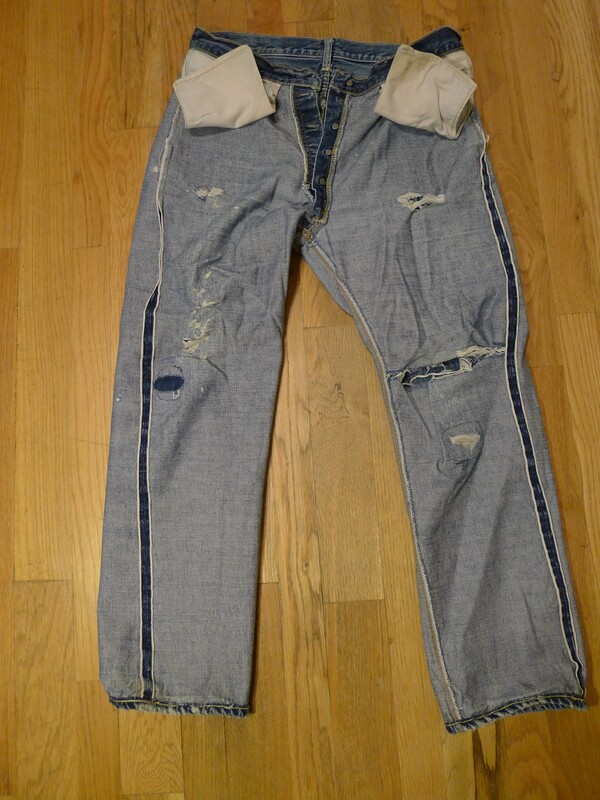 “lazy S” stitched on rear pockets. The “branded” Lee patch is long gone. You’ll notice on Lees, unlike Levi’s the selvedge denim self edged appears on only one side of the outer seam. 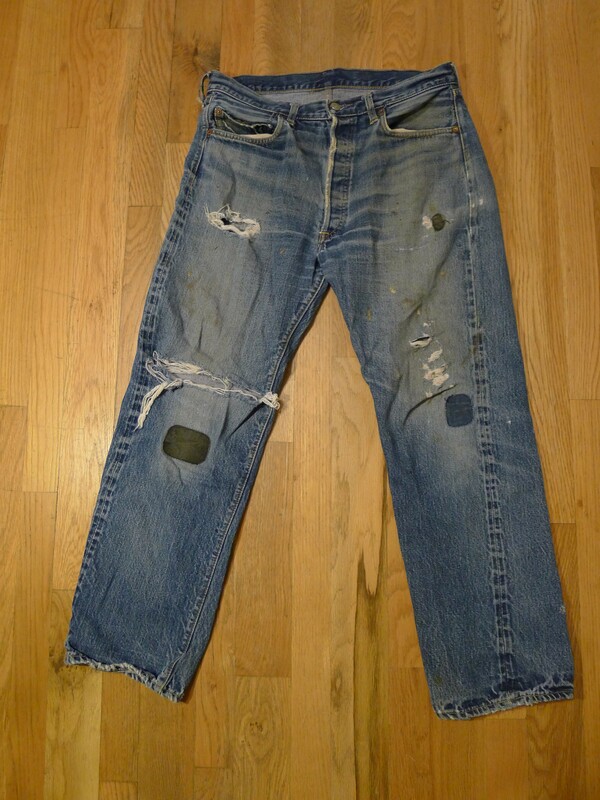 As with most items from time and place predating the “throw-away age”, these jeans are well-worn and have been mended multiple times. There’s a bout a 4.5″ x 6″ patch on the right thigh. 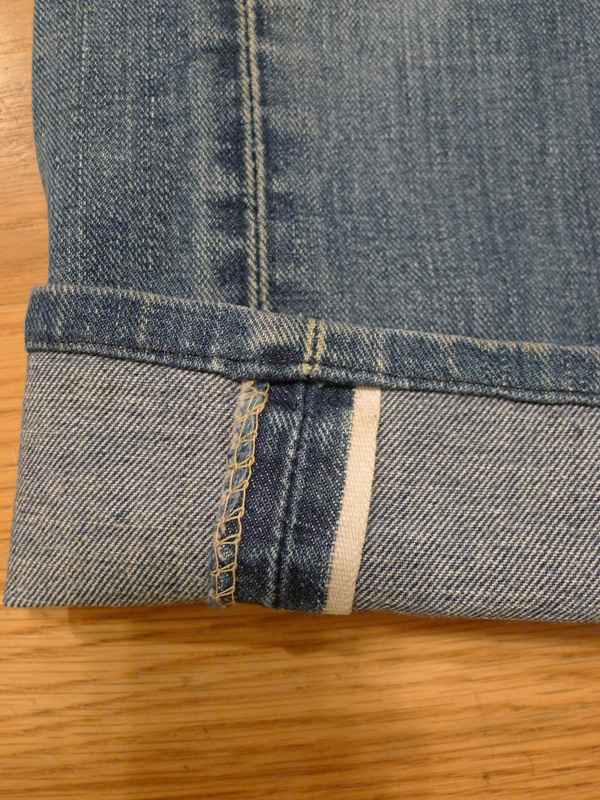 A 2″ x 3″ patch on the left side below the rear pocket. 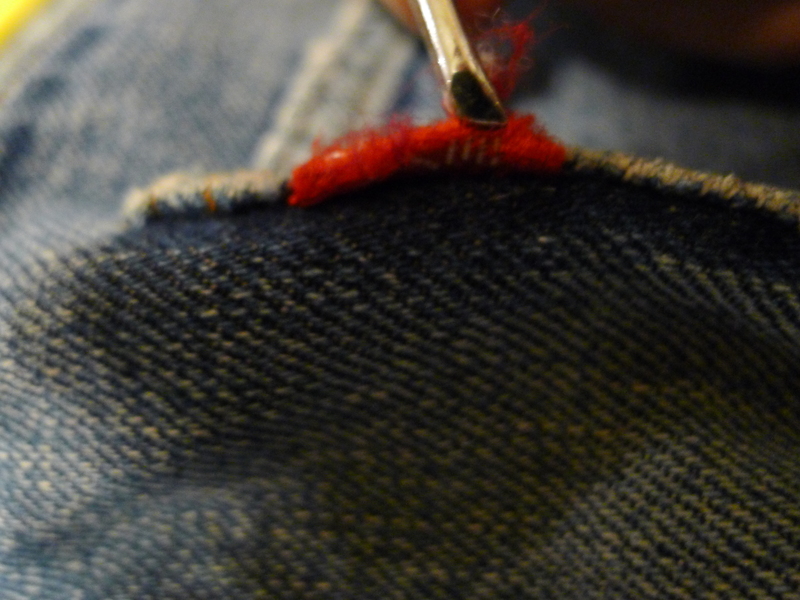 A hole and repair with red thread on the left knee, a small hole forming below the zipper on the right side front, and a 4″ hole in the left cheek with additional wear below. Some white paint and other darker stains. Round out the patina that only time can create. 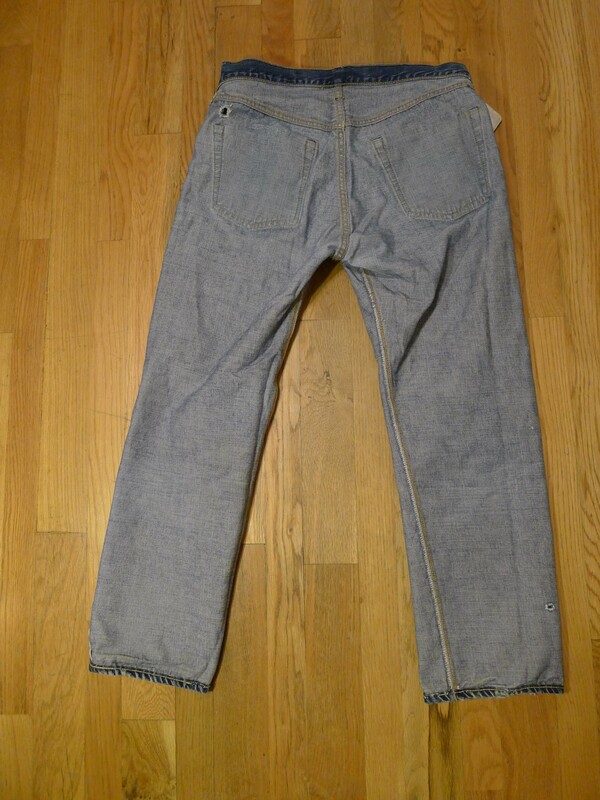 Levi’s Big E sevledge 501s, no patch. Double sided LEVI’S red tag. 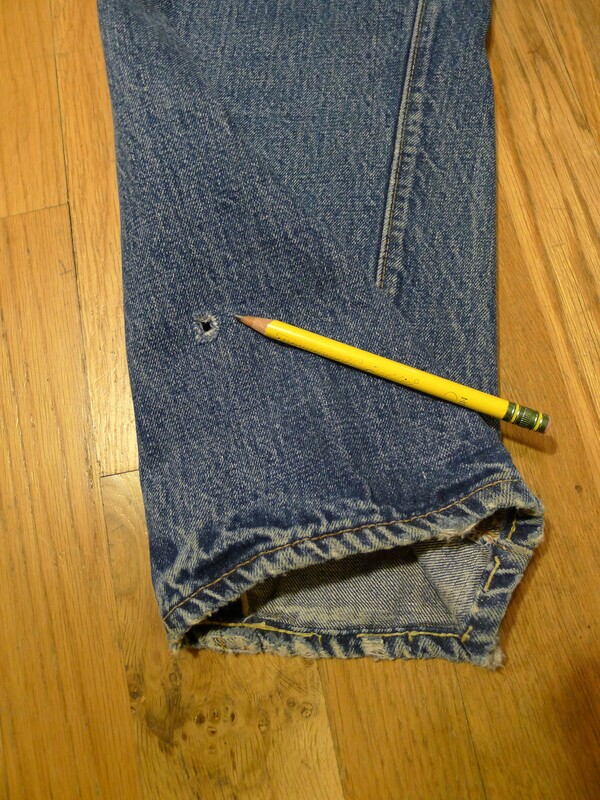 Single stitched back pocket, double coin. Top button marked with an 8. 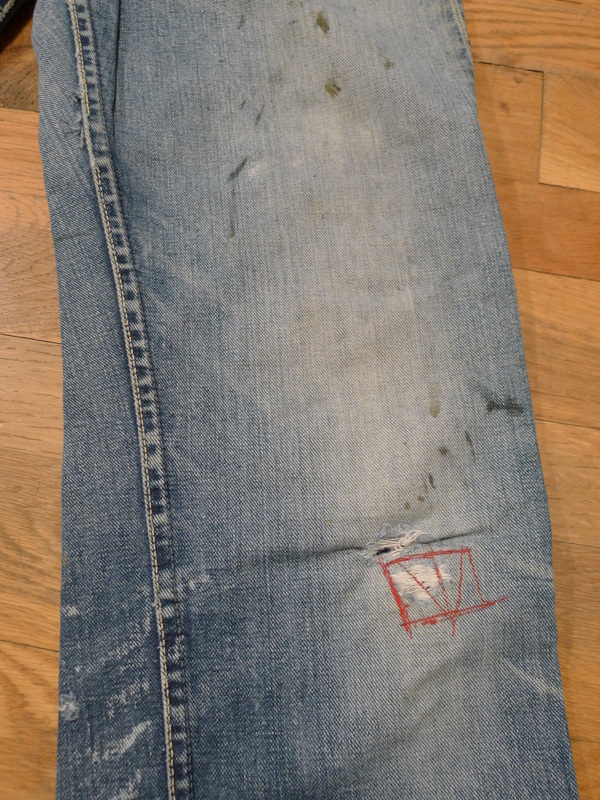 Not exactly sure the year of manufacture on these jeans, but the lack of rivets on the back pocket and double stitched coin pocket suggests these came towards the end of the big E run. These jeans also have a pretty high-rise from the crotch to top of the jean. 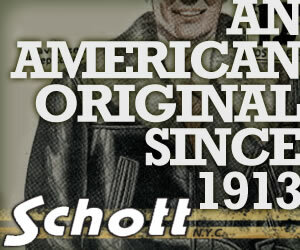 These jeans have that great look only obtained with age. 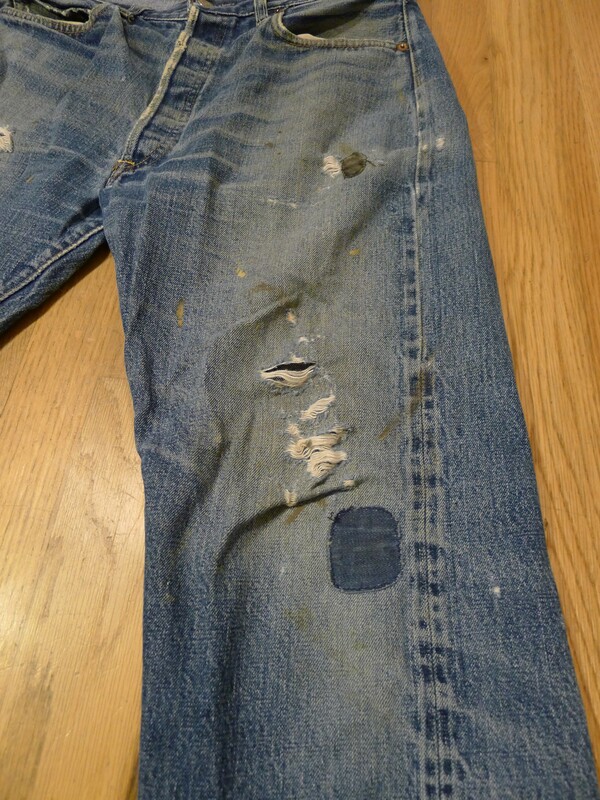 Major holes on the right leg with the knee hole spanning almost seam to seam. 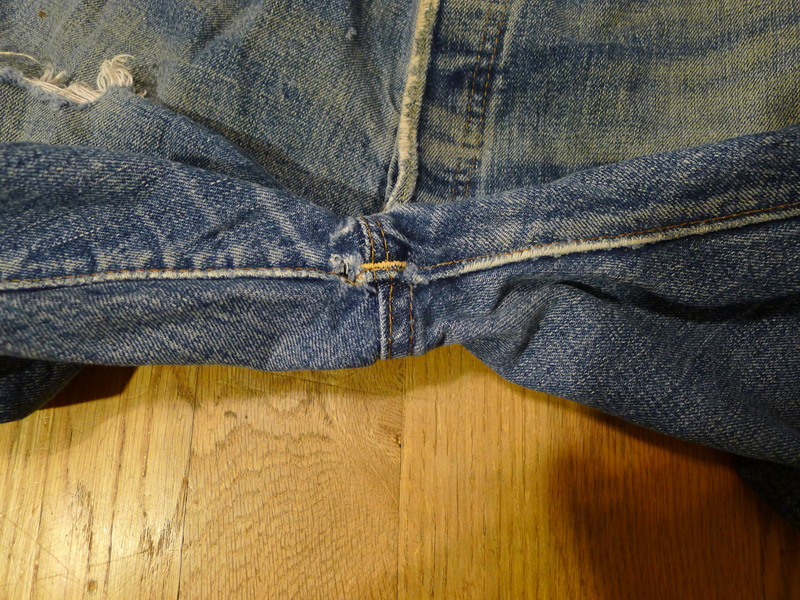 Left leg is worn heavily from the bottom of the pocket to the knee. Great denim patches of varying sizes on each leg. Another small hole on the back of left leg an upper right side hip. Crotch wear is not too bad, though there is a small hole. Stitching is complete still. Great whiskering around the crotch. Some stains and some dirt that would probably clean off. 70s? 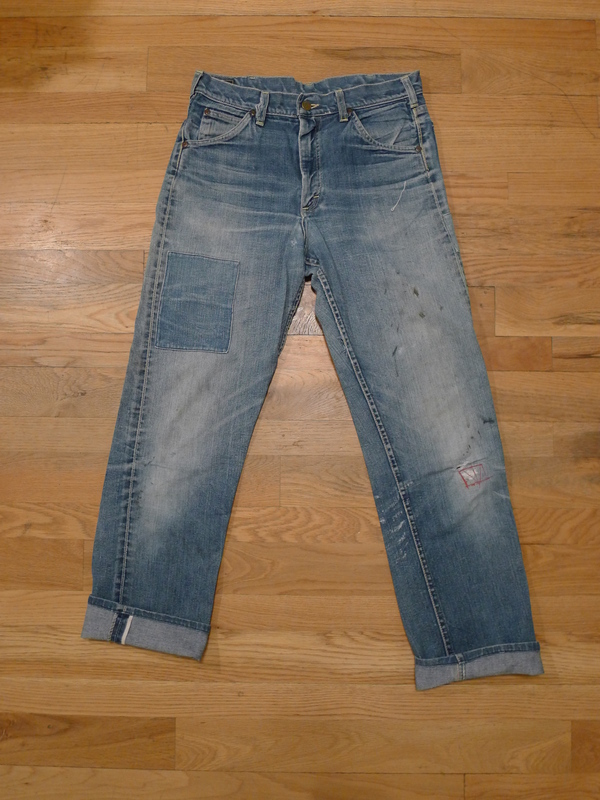 Levi’s 501xx redline selvedge denim jeans. 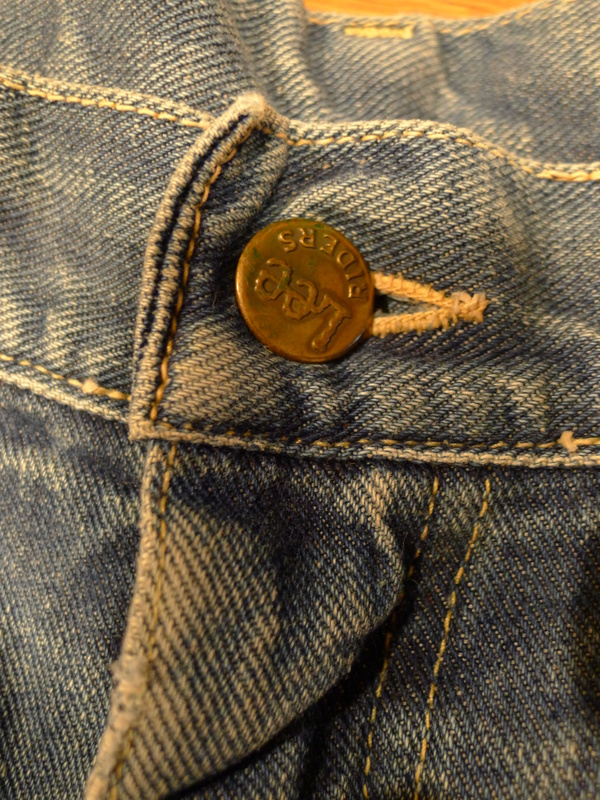 Double stitched back and coin pocket, Two sided Levi’s small e tag. 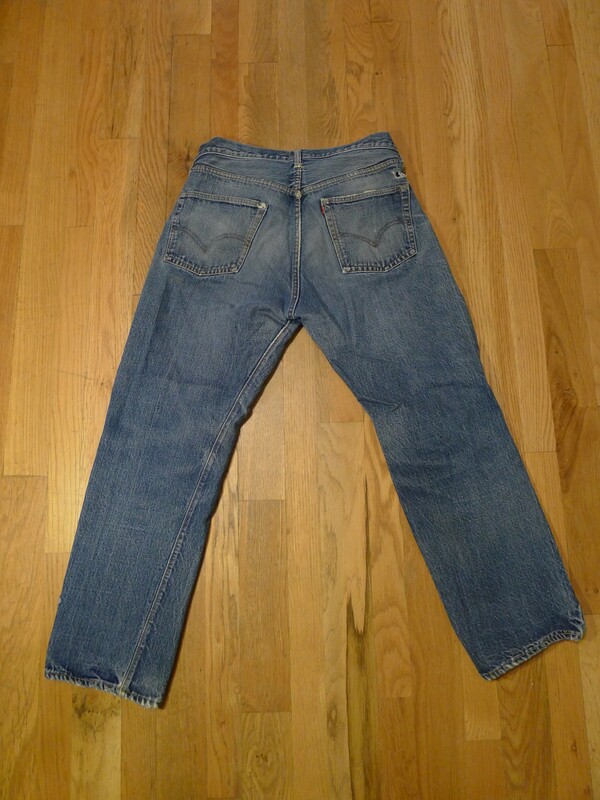 Levi’s Big E sevledge 501s, no patch. Double sided LEVI’S red tag. Single stitched back and coin pocket. No markings on button backs. 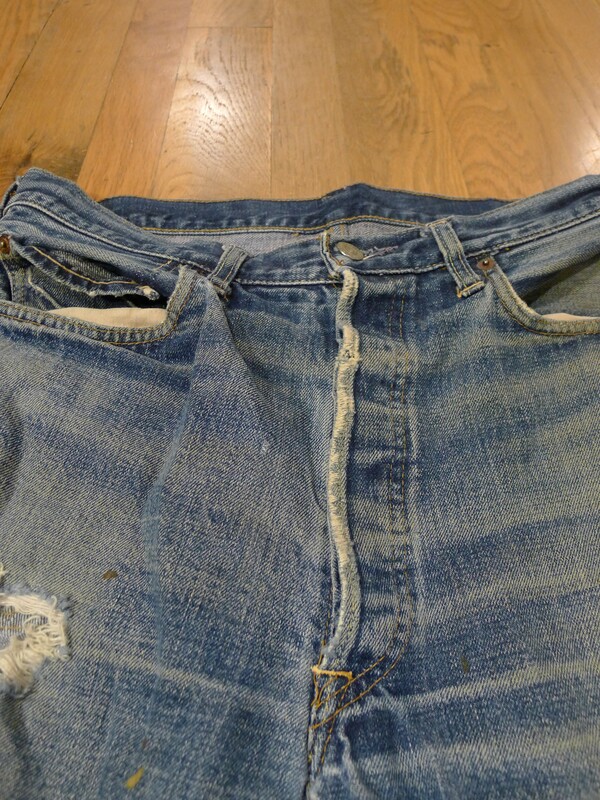 Riveted rear pockets. 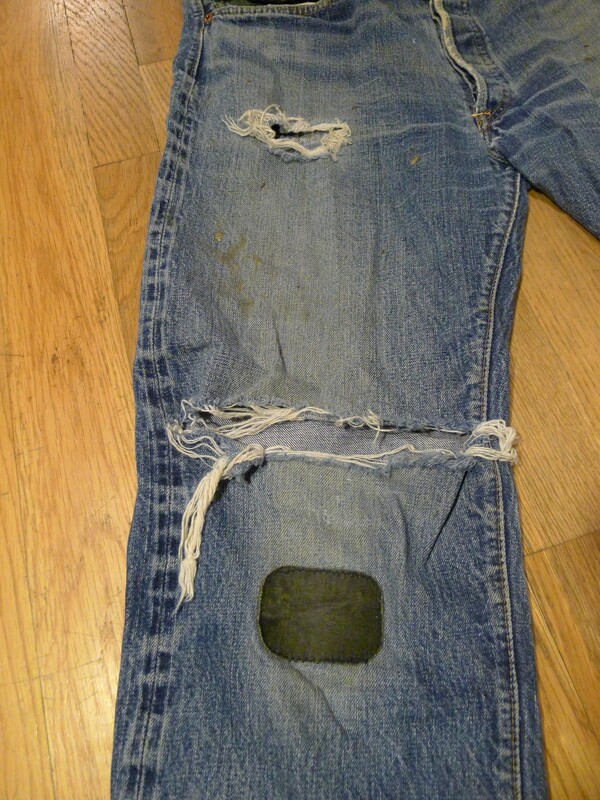 These old jeans have a great look to them, but are showing signs of their age. 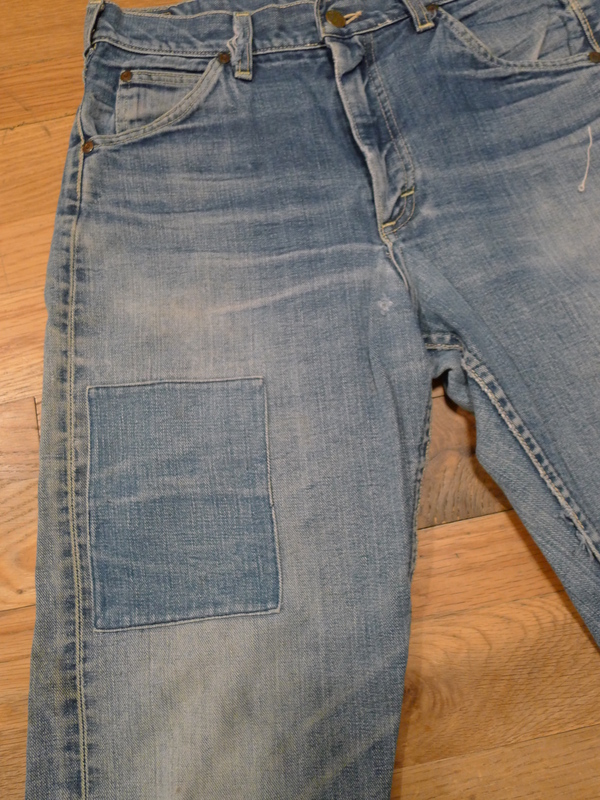 Moderate to heavy wear in the crotch, both front pockets have large holes, about a 3 inch tear in the left knee, lower stitching of the left rear pocket is coming undone (see additional photos link). White staining down the front and back of left leg. Inside rivets have rusted and bled on to pocket lining. 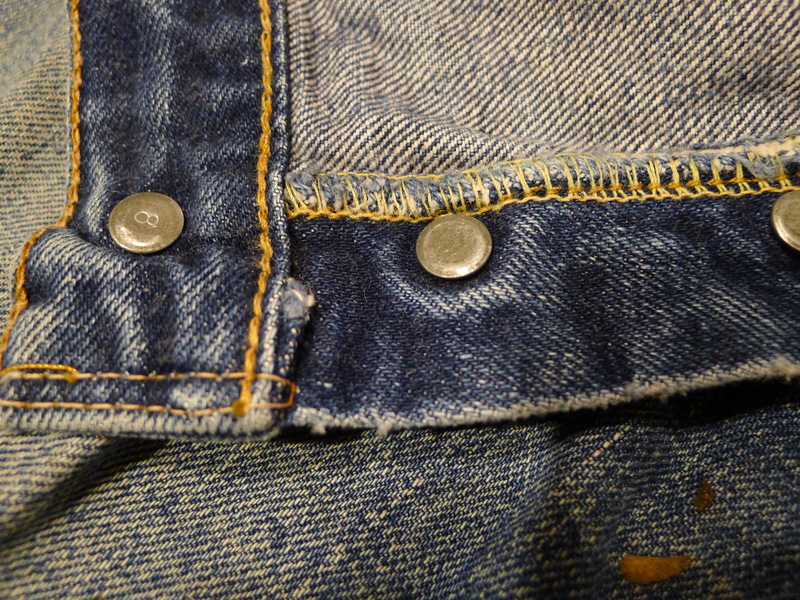 Middle three button-fly holes are still intact but are pretty loose when buttoned up. Vintage Levi’s second generation 507xx big E selvedge denim jacket. This jacket is in very nice condition with no holes, rips or snags. Denim is still dark and vibrant with only some lightening at pleats. Selvedge finish down the inside front, red line has since faded out. Stitching still bright and clean. 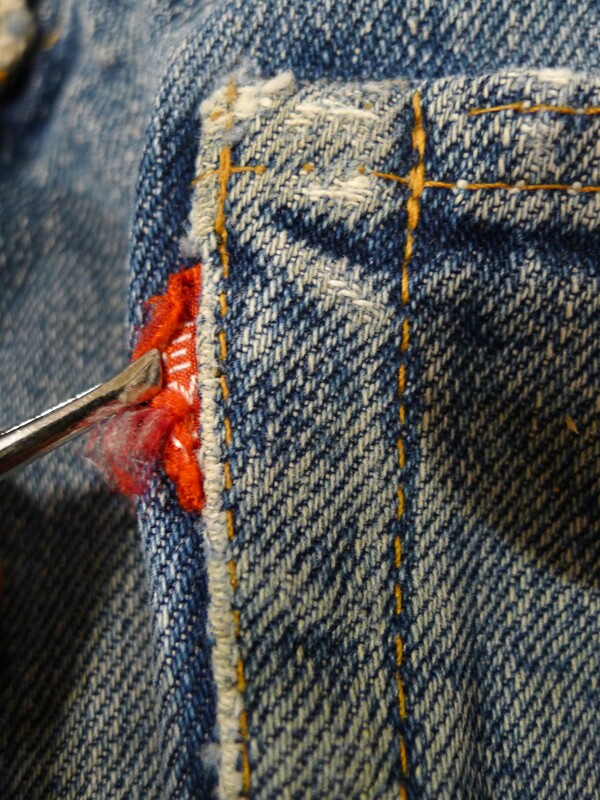 Loose threads along bottom inside hem the only imperfection.